New Image Stabilizer Binoculars will improve Marine Patrol's ability to conduct surveillance and search and rescue. 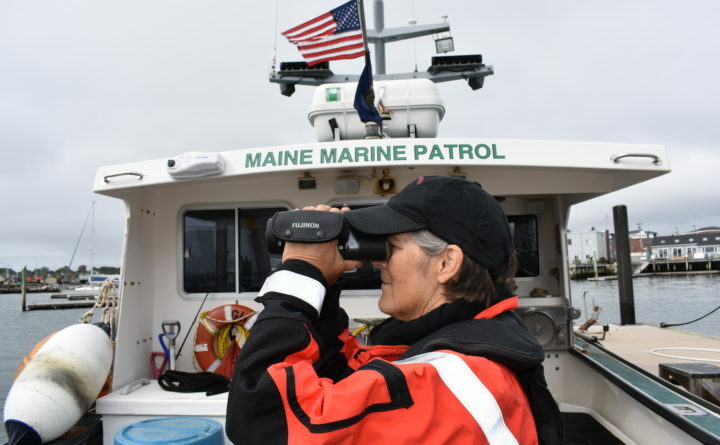 AUGUSTA — With a $3,200 grant from the Maine Outdoor Heritage Fund and matching funds of $2,339.50 from the Maine Department of Marine Resources, the Maine Marine Patrol has purchased binoculars that will improve officers’ ability to conduct surveillance for enforcement and search and rescue. The new 14×40 Fujinon Image Stabilization binoculars have been distributed to the Marine Patrol’s fleet of large patrol vessels throughout the state, replacing previous models that had only 7x magnification. “The enhanced magnification allows Marine Patrol officers to survey more area in greater detail,” said Marine Patrol Colonel Jon Cornish. “This is especially important as more fishing activity is moving farther offshore. “We made the decision last year that we needed to improve our ability to conduct surveillance of a fleet that is spread out over a greater area, and to build on our search and rescue capabilities,” said Colonel Cornish. A decision was made to purchase binoculars with higher magnification. “However, because of the continual movement of patrol vessels at sea, binoculars with greater magnification alone were not seen as practical because a more magnified image becomes unstable in the view finder,” said Colonel Cornish. The stabilization technology allows images at the higher 14x magnification to remain in view as Marine Patrol Officers stand on the deck of a moving boat. The waterproof binoculars are equipped with a durable hard plastic carrying case. The 40mm lens diameter provides superior light gathering, which is important when working in occasional low light conditions. “We’ve gone from trying to identify boats that we can barely see on the horizon, to being able to see the antennas on boats before we can see the actual boat because it is still below the horizon!” said Marine Patrol Officer Matthew Wyman. “It is common for the user of these new binoculars to point out vessels and fishing gear from such a great distance that the remaining MPO’s aboard the boat have difficulty seeing what the user is describing. These will without a doubt be a useful tool for Marine Patrol conservation cases for many years to come,” said Wyman. This project was funded in part by the Maine Outdoor Heritage Fund, in which proceeds from the sale of a dedicated instant lottery ticket are used to support outdoor recreation and natural resources conservation. For information about MOHF, visit https://www.maine.gov/ifw/.